The authors of this excellent publication are Stephen Slater and Simone Braverman. Stephen is an international English Language author and educator who was instrumental in securing the IELTS Test Centre at the University of South Australia. Since then he has been an IELTS Administrator, IELTS researcher and assessor. Simone is the founder of www.IELTS-Blog.com - a world renowned web-site for IELTS preparation. Her mission is to help busy people who English is far from perfect to achieve a high score in IELTS after a short preparation in their spare time - even if they had scored low previously, have a learning disability, too busy working 7am to 7pm or are afraid of exams. Over 30,000 people are subscribed to IELTS-Blog's daily tips and updates. I spoke to a few tutors who have been using this publication and they all had only good opinions of it. 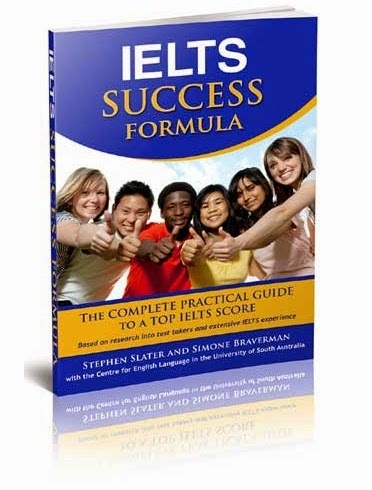 All of them cited that the key strengths of this book lie in the guided and holistic manner in which topics are covered instead of just focusing on test techniques which are inadequate for getting good IELTS scores. Personalised guidance is very important in IELTS. Every individual's strengths and weaknesses in the English Language and/or test-taking methods are different. 5 minutes spent on identifying specific flaws that a candidate has can be very much more effective than 5 hours of general IELTS coaching. The sole distributor of this book in Singapore - ISPL - has also put together an interesting package worth looking at. They have bundled 30 minutes of IELTS direct and personalised coaching with the purchase of each original book from them. In this half an hour session, their highly competent IELTS coach will cover broadly mechanisms that are relevant to scoring well in the examination as well as spend some time talking to the individual candidate to craft a personalised profile of the latter. If you are interested in finding out more about this book and the bundled deal, please contact the Marketing Manager, Alice Tay at 6100-0057 or e-mail her at alice.tay@ispl.sg. After 13 days of nervous waiting, the day of reckoning came uneventfully. I was with my kids at the Science Centre for an excursion when I used my mobile-phone to log onto the on-line results portal provided by the British Council and saw my scores. It took a while for me to digest the numbers but eventually when they sank in, a sense of relief filled me. I was pleasantly surprised when I saw the figures because although I had felt confident of doing well, getting an overall band score of 9.0 was a big bonus on top of my expectations. Having received my results, I decided to do a little bit of research to find out whether getting an OBS of 9.0 was an occurrence that took place every other day. 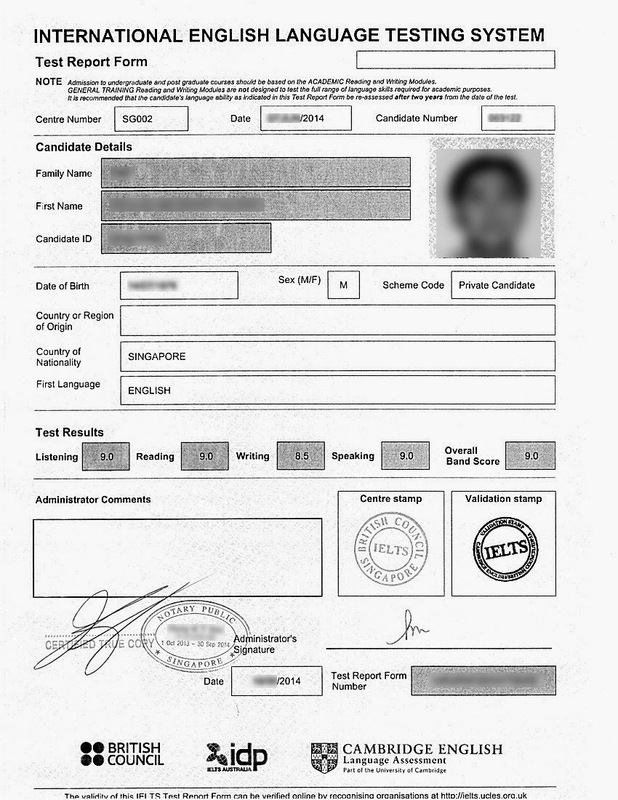 After some googling, I came to the conclusion that the majority of candidates who sit for the IELTS do not score above 7.0. This surprised me somewhat because I had gone into the examination without any form of preparation before-hand and achieved the results shown above. This triggered a chain of thoughts - whether there are certain aspects of my understanding of the English Language (and how I worked on improving my grasp of it) that can be transferred to other would-be IELTS candidates. If so, would it be possible to design a set of techniques that can be used to effectively carry that out. Last but least, I was curious about whether potential test-takers would be interested in exploring these methods. As I searched for information that could help me answer these questions, I came across forums and blogs that featured individuals who were (and still are) seeking ways to improve their performance in IELTS. This gave me the realisation that as someone who had taken the examination and achieved the maximum possible Overall Band Score, I was in good position to develop a methodology to help other would-be candidates maximise their chances of doing well in the tests. I decided to explore more into this and see how such an effective methodology could be designed and implemented. When I was a boy, I loved writing stories and crafting fiction as a past-time. I could easily spend hours with a notepad, scribbling ideas and concepts into it. The advent of computers in the late 80's made the process even more stream-lined. I learned how to type and got quite proficient in it, easily exceeding 100 words per minute. This new-found ability increased the speed and ease with which I could draft page after page of fantasy worlds in which warriors fought dragons. In school the English Language has always been been my favourite subject and I excelled in it relatively easily. Composition-writing used to be the stuff that made up the nightmares of my peers. Ironically it was the activity that I enjoyed most in school. While good grades were not the primary motivation for me, scoring consecutive A's for my writing assignments helped bolster my confidence tremendously. I took my IELTS last week as part of my Australian PR application requirements. As it was my first-time (and only time) taking the examination and I had not prepared myself prior to it, the entire process was completely alien to me. Security was tight and it was quite apparent that they were concerned about candidates getting other persons to sit for the examination on their behalf. Registration, photo-taking, pass scanning - the entire works were in-place to ensure that no-one could cheat during the various parts of the process. The examination itself was uneventful. The Listening test was straight-forward and it seemed more like a test of concentration than anything else. The pace was consistently fast and a momentary lapse in focus would have resulted in a candidate missing the answers to one or two questions. The conversations in the audio snippets were of heavily accented Australians and I had to be extra careful while answering certain questions because the given choices were not directly cited in the audio clips. The Reading test entailed a whole lot of articles and passages. This part of the examination lasted an hour although I had finished answering all the questions (with three rounds of checks) with 40 minutes to spare. I cheekily asked the invigilator whether I could have a tea-break and she shot me an incredulous look before replying that I should just take a nap then and there. The Writing test had just commenced when I woke up from my nap. Unlike the Reading test, this segment of the examination was considerably more challenging. The main struggle I had was with the physical act of writing itself. Having become so accustomed to typing on a computer for almost all of my daily work, I discovered to my horror that writing was no longer as straight-forward as I remembered it to be. My written words looked like they were scratch-marks by a frantic chicken. Fortunately though I had written my script in pencil and erasing the mistakes were done far more easily than if I had done it in ink. The time given for the Writing test was barely adequate as I was still making the final changes to my script when the bell went off. On hindsight, I believe it was due to the lack of planning that resulted in this. Had I spent some time to draw out the main points of my scripts, I would have saved a substantial amount of time in error correction. Nevertheless the written examination segments went well and I felt confident of getting a good score. It was one of those examinations that you get good vibes about after the few gruelling hours of writing. The Speaking test had been scheduled for the next day at the British Council and it was fortuitous that this was so because I was feeling quite drained after the Writing Test. The next day (which incidentally was a Saturday) I went to the British Council to sit for my Speaking Test. Again I reached the British Council early and there were already other candidates waiting for their turn just outside the examination room. One by one they entered and exited the room, some beaming as they did while others appeared rather downcast. When it was my turn, the butterflies in my stomach were fluttering madly, creating a tempest within. I took a deep breath, knocked on the door and stepped into the room with a cheerful morning greeting. The tester, an equally cheerful-looking Australian lady, returned the greeting with a smile. She introduced herself and invited me to take a seat. At the same time, she pointed to a voice recording device and mentioned that the entire conversation would be recorded for the purpose of auditing and reviewing. The test began uneventfully and progressed well, with the entire session developing into a vigorous conversation about my place of residence, the definition of intelligence, role models in my life whom I deem intelligent. It turned out to be quite a philosophical discussion and I enjoyed it. I believe the tester enjoyed it too because at the end of the session when we were about to part ways, she commented that it had been a very interesting engagement. That wrapped up my IELTS examination-taking process and I came away as a better person, knowing that I had experienced something that has become a qualifying standard recognised worldwide. The results of my examination will be made available on the 13th day after the Speaking Test and for the next one week or so I will be waiting for them with bated breath.